One very particular joy of the Internet is its ability to bring us closer to our favorite celebrities. No longer will you experience FOMO if you missed out on the E! True Hollywood Story of so-and-so — just YouTube it, girl! On the other hand, that means said celebrities kinda have to be on, 24/7. Paparazzi are just as ferocious as ever, and what's more, anyone can be one with their smartphone. It makes the difference between a scripted interview and a truly candid moment all the more obvious. Things were not always this way, though. Way back when — in some cases, before this beloved Series of Tubes was even constructed — people were still getting interviewed, and the results were still being recorded. Because there is nothing like a little nostalgia to get our emotions flowing, we decided to provide you with some excellent procrastination material in the form of very early interviews from your favorite famous faces. The following clips and snippets offer a fresh perspective on the stars you know and love today. Which is great. But, more importantly? This article will seriously improve your trivia cred. It's actually unbearable how cute this is. That is a statement that would apply to almost anything Drew Barrymore does at any age, but it's particularly true here. Like most interviews with child stars, it's an uncanny mixture of entirely raw moments and statements that sound freakishly adult (the way she says "Kathy Kennedy, the producer of E.T. is so weirdly mature, it's jarring). To quote 8-year-old Ms. Barrymore, well, "Sometimes, you know, you feel like crying." While she's now best known for Silver Linings Playbook and The Hunger Games, Winter's Bone was Lawrence's true breakout role. Before that, though? She earned her creative cred in a variety of roles, including The Poker House, directed by Lori Petty. She's nowhere near as outspoken here, at only 18, but you can still see that signature personality shining through. Also, by the way, can we borrow that dress? Before she was a Black Swan or a Manic Pixie Dream Girl, Natalie Portman was just a girl. With a dog. Who happened to be featured on The Jon Stewart Show. Image: Courtesy of Seventeen Magazine. Before she had even broken into the world of film, Meryl was an accomplished actor on Broadway and in other theatrical productions. 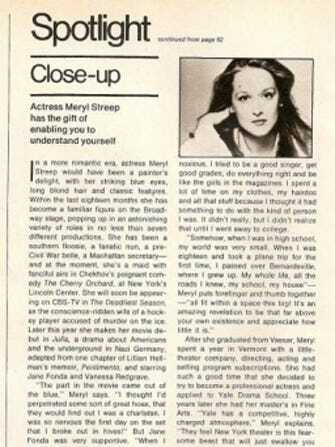 Seventeen had the good sense to highlight her work in a brief feature in 1977. Streep had just landed her first movie role in the film Julia, at 28. Of her first day on set, she humbly said, "I thought I'd perpetrated some sort of great hoax, that they would find out I was a charlatan. I was so nervous the first day on the set that I broke out in hives!" Her enthusiasm here is a far cry from the demure, removed presence she offers in pieces like this memorable interview in The Washington Post. But, that doesn't mean she's short on wisdom. "I was the lead in the musical three years in a row, was a cheerleader, went with the fullback of the football team, and got into a very good school — Vassar," she muses about her teenage years. "But, I wasn't really very popular. People were jealous of me because of all these accomplishments. I didn't realize that I must have been obnoxious. I tried to be a good singer, get good grades, do everything right and be like the girls in the magazines. I spent a lot of time on my clothes, my hairdos and all that stuff because I thought it had something to do with the kind of person I was. I didn't really, but I didn't realize that until I went away to college." Today, Will Smith is the pinnacle of professionalism. Even though he's done some less-than-perfect movies, he's sort of beyond reproach as a Hollywood figure. That's why it's so exciting when you see him and his family doing something silly. That's also why it's even more exciting to see him acting like a quintessential cocky teenager, goofing off and messing around as if totally unaware that the world is watching. Miley Cyrus Oh. Em. Gee. Can you believe how cute she is? Also, we need to get the "Mileymeter" out of storage. We're willing to bet the readings would be off the charts these days. One of the reasons people were so excited about Girls is the fact that Lena Dunham has done some great stuff with feature film, some of which she talks about here. And, much like Girls, much of it is "embarrassingly autobiographical." Or, should we say, Stefani Germanotta? Given the highly polished, perfectly orchestrated facade of Gaga we now know, it's hard to imagine that she was ever stumbling her way up the ladder, facing the classic struggle of publicity vs. dignity that every musician knows so well. This "photoshoot" was conducted for her first-ever album and it appears she is interviewing herself. Still, though, you can see her talent for clever self-promotion and her obsession with the concept of fame — and it's kinda fascinating to watch her work in such a relatively unmediated way. At only 11, it's pretty insane how grown-up Emma Watson seems in this group interview on The Rosie O'Donnell Show. The best part, though, is undoubtedly when Rosie is talking about her own experience in school plays, and Emma is trying to laugh but is clearly kind of terrified. So, we all know Kanye is kind of a crazy guy. Maybe just a touch arrogant. But, it turns out, back in the day he was...well, not that different. He was already making all kinds of vague statements about his design abilities, and had more ambition than he knew how to handle. It's kinda cute, though, right? Also, the below video is a true deep cut, from 1998. You have to wait a while for him to come up, but when he does, you will be thrilled. It's not much of an interview, but it is a joy to behold.